The global economic outlook remains constructive, though, with deteriorating expectations. Short-term cyclical risks are titled to the downside in the Euro Area, yet, the fundamental factors underpinning the economic expansion remain in place. Following a strong economic expansion in Austria, a pleasant slowdown is underway. Solid labor market conditions keep supporting consumer sentiment and private consumption. In CEE there are no signs of an abrupt growth slowdown. Economic growth has remained surprisingly resilient. Nevertheless, growth will slow down gradually over the medium-term. The global expansion has passed its peak. The global economy is projected to grow at 3.5 % in 2019 and 2020 after 3.7 % in 2018 (OECD Economic Outlook No 104 – November 2018). Projections of global GDP growth for 2019 have been subject to gradual downward revisions throughout the year, starting from 3.9 % in March (OECD Economic Outlook) and 3.7 % in September (OECD Interim Global Economic Outlook Assessment). The slow-down of growth momentum has been accompanied by a gradual decline of global economic sentiment (Figure 1 - see pdf). 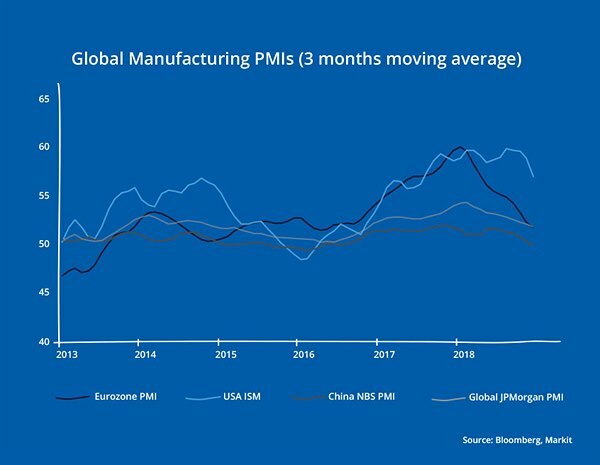 This was most pronounced in the Euro Area where the Purchasing Manager Index (PMI) for the manufacturing sector has declined from 60.6 in December 2017 to 51.4 in December 2018. Nevertheless, business cycle indicators remain in expansionary territory as being indicated by PMI values of greater than 50. The European Central Bank (ECB) forecasts the Euro Area economy to grow by 1.7 % per annum during the next two years. In the United States growth has been more resilient and sentiment indicators only dropped in December when the ISM Manufacturing Index decreased to 54.1 from 59.3 in November. The US Federal Reserve projects the US economy to grow 2.3 % and 2.0 % in 2019/20, following 2.9 % last year. Hence, the current outlook remains constructive but expectations have deteriorated lately. Risks to the growth outlook are tilted to the downside. Downside risks related to trade protectionism from the US-China trade war have intensified, despite a recent 90-days long cease-fire which was agreed on during the G20 Buenos Aires summit. In March, the UK will leave the EU and Theresa May seems to lack parliamentary support for her Brexit deal, creating uncertainty regarding the future EU-UK relationship. Signs of weakening economic activities have been increasing by year-end in Italy, while political tensions have been relieved somewhat by reaching a 2019 budget agreement with the EU. Despite these downside risks, evidence for a burgeoning recession is unapparent, yet, major stock markets lost considerable value over the last quarter of 2018. Financial conditions have been deteriorating. Financing costs for lower quality corporate borrowers have worsened significantly. Non-financial US speculative-grade firms pay more than 700 basis points in interest rate (Single B, 5-year maturity) for refinancing; compared to 500 basis points a year ago (Figure 2 - see pdf). Worsening financial conditions can induce a financial shock that propagates a slowdown in consumption, investment and employment. Methodologically, it is hard to predict recessions which are usually induced by unforeseen shocks hitting the economy. Neither is the length of a long U.S. expansion a good predictor. Except for rising cyclical downside risks, the baseline macroeconomic scenario remains overall constructive. The growth slowdown has been most visible in the Euro Area, where quarter-on-quarter (q/q) GDP growth declined to 0.2 % (seasonally adjusted) in Q3 2018 after 0.4 % during the first half of the year and 0.7 % average quarterly GDP growth during 2017. Yet, the fundamental factors underpinning the Euro Area economic expansion remain in place. The recent growth slowdown can be linked to lower external demand, while domestic demand has remained robust with investment growth even accelerating (Figure 3 - see pdf). Additionally, a disruption of car production due to new vehicle emissions standards (Germany) weighted likely temporarily on industrial output in Q3. Our nowcast model indicates 0.3 % (q/q) GDP growth for Q4 2018. Over the medium-term, significant improvements on the labor market, the unemployment rate has fallen to 7.9 % in November, and rising incomes, negotiated wages are expanding at growth rates exceeding 2 %, should continue to support Euro Area domestic demand. Following a strong economic expansion, a cooldown of the business cycle is underway in Austria. In Q3 2018, real seasonally-adjusted GDP rose by 0.3 % compared to Q2. During H1 2018, quarterly GDP had risen on average by 0.6 %. Yet, solid labor market conditions keep supporting consumer sentiment and private consumption. The Austrian labor market has seen tremendous improvements during the cyclical upturn and the unemployment rate (seasonally-adjusted, Eurostat) was 5.1 % in October. A continued moderation in the growth momentum of the Euro Area would also have implications for the ECB’s monetary policy. In case the business cycle momentum fails to appear and inflation remains below expectations, the ECB might have to defer the start of an interest rate hiking cycle, which is now signaled for the second half of 2019. Financial market expectations have been revised in Q4 2018. While a 12 basis points (bp) rate hike, over a 12 months period, was implied by EONIA forward rates in early October, no rate hike (only 4 bp) was implied until the end of 2019 at the beginning of the year (Figure 4 - see pdf). Whether an interest rate hiking cycle will be initiated in 2019 will crucially depend on the development of core inflation (excluding energy and food prices) which is expected by the ECB to increase gradually by 1.4 %, 1.6 % and 1.8 % (2019-21), hence, reach the inflation target only at the end of the forecast horizon. In the US the Fed is continuing its interest rate hiking cycle. In December, the range of the fed funds target rate was raised by 25 basis points to 2.25-2.5 %; the 4th interest rate increase in 2018. The Fed’s economic projections show two interest rate hikes in 2019 and one in 2020 based on the continuation of the economic expansion and inflation to develop around the Fed’s inflation target (2 %). For 2019 and 2020, the Fed forecasts the US real GDP to grow by 2.3 % and 2.0 %. The key policy rate is about to reach its neutral level (2.8 % according to the Fed), where monetary policy is neither expansionary nor contractionary. Financial markets are questioning the Fed’s willingness to increase interest rates again in 2019, as being signaled by the flat short-end of the US treasury yield curve. The Central- and Eastern European (CEE) region continues to narrow the gap to the Euro Area. Economic conditions remain favorable and labor markets continue to improve or have already reached full employment. Economic growth in CEE (ex Russia) has peaked in 2017/18 and has remained surprisingly resilient to the global, and Euro-Area, growth slow-down. We have revised our growth projection for 2018 accordingly to 4.3 %, from previously 4.0 %. Over the medium-term economic growth will slow down gradually and return to more sustainable levels. We project GDP growth in the CEE region (ex Russia) at 3.6 % in 2019 and 3.3 % in 2020 (Table 1, page 4). In Central Europe (CE), economic conditions remain favorable. All CE economies, except for the Czech Republic, show continued strong growth momentum. In the Czech Republic the most dynamic phase of the business cycle has come to an end and economic growth has declined to more normal levels. In Hungary buoyant domestic demand continues to fuel the economic expansion why the National Bank of Hungary is now preparing for a gradual and cautious monetary policy normalization. Economic growth has stayed remarkably strong in Poland too. In contrast to Hungary, however, there are no signs of inflationary pressures to emerge. Russia strands to generate stronger growth. Amid signs of tepid economic activities in the second half of the year, we lowered our estimate for GDP growth for 2018 (from 1.9 % to 1.5 %). Ukraine sustains the recovery, despite an inflation rate that is too high. A new agreement with the IMF resumes financial support for the economy. In South Eastern Europe (SEE), economic growth also reached its peak in 2018 (3.4 %). The unemployment rates have come down significantly, yet, they remain among the highest in Eastern Europe. Inflation rates are expected to remain benign over the forecast horizon. Serbia had a strong cyclical upswing in 2018 and we expect growth to reach a more sustainable level. Construction activity has recently thrived in Serbia, and also in Montenegro. Tailwind from the business cycle helped to improve public finances in several countries, which traditionally had weak fiscal policies (including Croatia, Serbia, Albania). While public infrastructure spending fuels growth in Montenegro, it also stretched its debt development. Overall, the macroeconomic outlook remains constructive, though, with deteriorating expectations. Following the peak in 2017/18, global economic growth is projected to slow down in 2019/20. Uncertainties related to trade protectionism, the Brexit deal, political difficulties within the Euro Area and financial market volatility remain prominent. Short-term cyclical risks are titled to the downside in the Euro Area, yet, the fundamental factors underpinning the economic expansion remain in place. Following a strong economic expansion in Austria, a pleasant slowdown is underway and solid labor market conditions keep supporting consumer sentiment and private consumption. In CEE there are no signs of an abrupt growth slowdown. Economic growth has remained resilient and surprised to the upside in many CEE economies during the past quarters. Nevertheless, growth will slow down gradually over the medium-term.